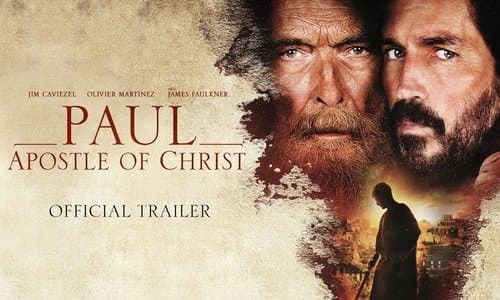 "Paul, Apostle of Christ," a movie about Saul of Tarsus, one of Christianity's most transformative figures, is set to hit theaters March 28th. The film, directed by Andrew Hyatt, chronicles the apostle's last days, which were spent in a Roman prison awaiting execution under Nero. St. Luke visits him, as is in the biblical account, and writes the history of the early church, recounting the missionary's journeys to spread the Gospel that are recorded in the Acts of the Apostles. The story is fascinating not only because of Luke's dangerous pilgrimage (the emperor is determined to eliminate Christians) but because of Paul's amazing transformation. Paul's revered story of transformation from ardent persecutor of Christians to one of the religion's most powerful evangelical forces has renewed relevance, Caviezel says. The scene in which Paul holds Luke back from calling for righteous violence against Roman oppression speaks to the need for understanding and forgiveness. "Forgiveness starts with not just love, but ardent love," says Caviezel. "It's really easy to love people who think like you think; it's very hard to treat someone with a polar opposite view with the same dignity and respect you would treat a friend. That's this movie's core message." "The name Saul means 'great one.' The name Paul means 'little one'". "While making this film, I learned that by changing one tiny letter, we can become great in the eyes of God. But it requires us to be little, if we wish to be great. This is the way of the saints; this is the way of the holy; and this is the way Saul became St. Paul." Caviezel is also working on a sequel to "The Passion of the Christ" with director Mel Gibson that focuses on the Resurrection.